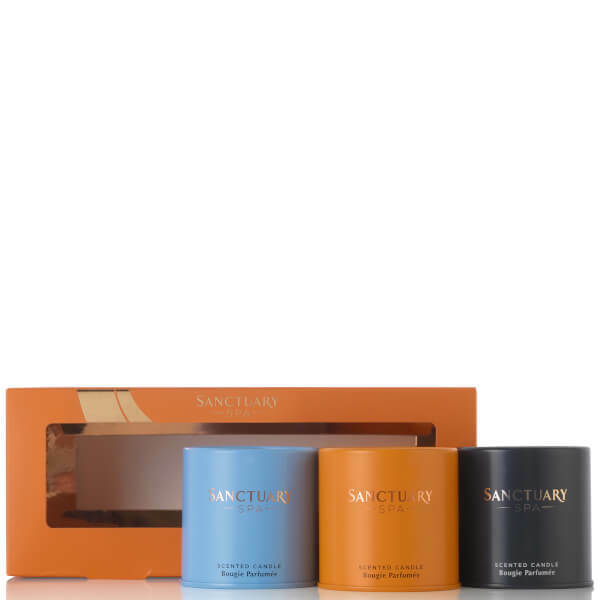 Relax and unwind with the Sanctuary Spa Trio Mini Scented Candles. The gift set brings together three of the brand’s bestselling scents to infuse your home with warmth and calm. Housed within a decorative gift box. Discover the iconic floriental scent. Opening with bright citrus top notes which mingle beautifully with the sophisticated floral heart, the fragrance settles on a musky oriental base that encourages you to relax, unwind and let go. Housed within a sleek glass jar that mirrors the elegant scent. Infuse your abode with calming aromas. Blended within sustainably-sourced palm wax, the indulgent scented candle unleashes an olfactory melange of golden Saffron, white florals and Rose that rest on a decadent base of heady, honey-like Amber and musky Oud. Housed in a sleek tin container topped with a protective lid. Welcome the relaxing notes of beachside Sage and lapping waves into your home. With a light and fresh perfume, the scented candle combines accords of zesty citrus fruits with sun-drenched driftwood to create a truly hypnotic and calming home fragrance. Perfect for any room in the home, it will leave a trail of soft and relaxing ambience. Housed in a pastel blue tin with gold accents.